We are glad to share the Abhang of Sant Eknath "Kayaa Hi Pandhari Aathma Haa Vittala"
In this Abhang Eknath says His Body is Pandhari, His Soul is Vittal and only Panduranga dwells inside him. With faith and devotion he has offered all his senses to Lord Vittala. He finally concludes that he see the sanctity of Pandhari in Himself, in all human beings and in all surroundings and that is the place of pilgrimage inside us. Lets see the Lord everywhere and take the pilgrimage today. Come join the Varkari by hearing this divine Abhang sung by Pandit Bhimsen Joshi. My body is Pandhari and my soul is Vittal. Only Panduranga dwells inside me. My faith and devotion in Panduranga is like flowing water of Bheema river. Compassion, Forgiveness and Peace in our heart is like gathering of Vaishnavites in the sands of Chandra Bhaga river. Awareness, Meditation, Prayer and Prudence is my happiness like notes emanating from Krishna’s flute. 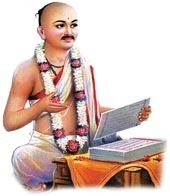 I have gathered all ten of my organs of senses (five Jnanendriyas) and of actions (Karmendriyas) that is my offering to the Lord. Eknath says, i see the sanctity of Pandhari in Myself, in People and in all surroundings. That is the place of pilgrimage inside us.